Wow. I have the privilege to be a guest blogger on my sister’s blog. At first, my husband and I concluded that her blog was just another indication that my DINK sister had just too much time on her hands. (Jealous maybe?) But I readily admit that I think it is a great journal of her life and have enjoyed checking in with her by reading it every few days. It makes me feel connected to her – through technology and food – even if we are 450 miles apart. Fortunately, we were a little closer this holiday season when she, Howard and guest star Bella came to celebrate the winter solstice (or Christmas) in our house with us. I am always in charge of dessert on Christmas since I love to bake. 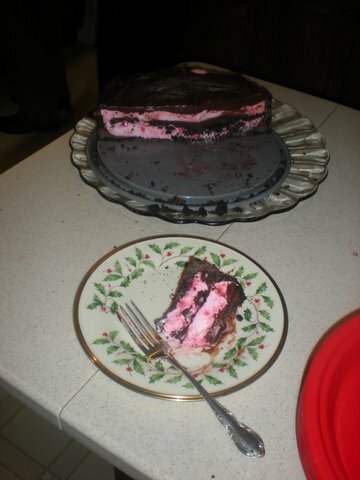 For the last few years, I have looked forward to the once annual appearance of my Peppermint Ice Cream Cake. It’s not really baking but it is simple and delicious. Is there anything better than chocolate and peppermint??? This year, my husband and both of my in-laws let it slip that they were sick of that cake. 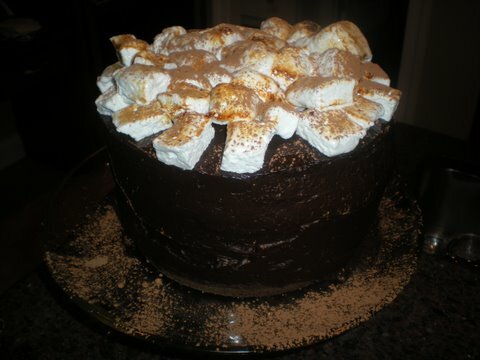 Really disappointed to miss out on my favorite, I did some soul searching research and found an alternative from Fine Cooking, Hot Chocolate Layer Cake with Homemade Marshmallows. The cake was a bit complicated to make and assemble, but it was beautiful to look at. The frosting was unbelievably rich and the cake a bit dry but the marshmallows made it all worth while. The marshmallows were amazing and surprisingly simple to make. Still I missed the ice cream cake. I just couldn’t let the season go by without my Peppermint Ice Cream Cake. So when my husband’s aunt invited us over, I suggested that I bring dessert and she agreed. The Peppermint Ice Cream Cake was a big hit – and my husband ate two pieces. Guess he missed it too! The ice cream has to firm up between layers so it’s best to start making this cake the day before or at least the morning you will serve it. Make the glaze first and let it cool while you make the crust. Bring cream and corn syrup to a boil in saucepan. Remove from heat. Add chocolate and whisk until melted and smooth. Let stand until cool but still pourable, 30 minutes to 1 hour. Melt butter with chocolate in saucepan over low heat. Finely grind cookies in processor. Add warm chocolate mixture. Blend until crumbs are just moistened. Reserve 1 cup crumb mixture in small bowl. Press remaining crumb mixture onto sides and bottom of 10 inch springform pan. Soften the ice cream in microwave for 20 or so seconds. Spoon half of the ice cream into the crust and spread out evenly. Sprinkle with reserved cookie crumbs. Pour half of the the glaze over the ice cream and freeze until firm – 90 minutes or so. Top with remaining ice cream, spread evenly. Stir remaining glaze over low heat until just pourable but not hot. Pour over ice cream and freeze for at least 4 hours or overnight. Remove from freezer about 15 minutes before serving. Remove sides of springform pan and garnish with candy canes or peppermint candies. Posted on 28 December 2009, in General and tagged desserts. Bookmark the permalink. 2 Comments. Jane is an awesome baker. Both desserts were great, and I’m not even a huge chocolate fan. We were so happy to spend a few relaxed days with Jane and her family. I’m sorry it’s time to go home tomorrow.